Brother Kazon Hyme of the salamanders made a name for himself in the 3rd war for Armageddon, when his scout squad boarded one of Ghazghkull’s Rok’s that had landed along the Hemlock river. He led his men through the labarynthine structure burning and crushing greenskins with his Inferno Pistol and forge hammer, and after nine days of Guerilla actions in the hive-like asteroid, he finally laid his promethium charges at the base of a giant weapons cache and led his still entact squad from the vessel to watch it burn. Of the hundreds of squads of Salamanders sent into the ships, his was the only one to exit, fully intact and ready for its next mission. Such is the regard Kazon has for his Fellow Astartes that he has never left a man behind, whether injured or dead he has always brought his battle brothers back to Nocturn, such honorable behaviour has earnt him a place in the Fire Drakes, the elite first company of the Salamanders. Kazon has ever been the devotee of the Promethean Cult, he prides himself on his self reliance, and before being deployed to the Deathwatch, took the oath of the lone dragon, and vowed never to remove his armour or relinquish his weapons until he returned to the forges of Prometheus. 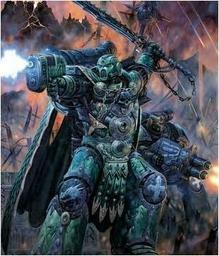 Recently Kazon was deployed in the cleansing of Renoir’s World with the Deathwatch under command of Inquisitor Darrius Vex and witnessed the heresy and infestation of the Thunders word, although captured and in stasis for much of the battle, once revived he lead a handful of other loyal Astartes to purge many a foul demon from the vessel. After a mission to investigate and cleanse the spacehulk “Wrath of Achilles”, Brother Kazon joined the depleted fire team of brothers Skold, Raimer and Navarre.